Please do not eat hard foods: nuts, ice, crisp taco shells, whole apples and carrots (cut them into pieces first), hard French bread crust and rolls, spareribs, corn on the cob (cut the corn off the cob before eating), and popcorn! These foods risk breaking brackets and wires. Also beware of nail biting and pen or pencil chewing habits, since these can damage your braces. 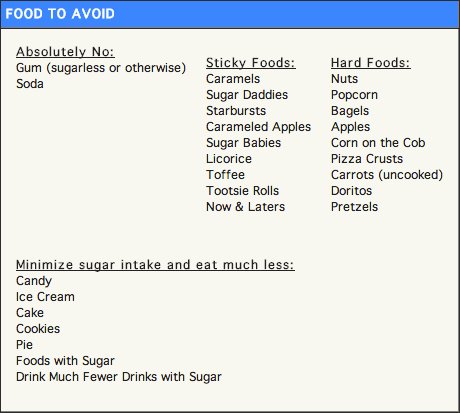 Do not eat sticky foods: taffy, caramels, bubble gum, or sticky candy of any sort. A small piece of sugarless gum occasionally is acceptable. Use common sense about most foods.